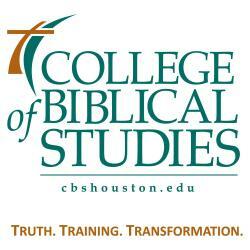 HOUSTON, June 26, 2018 /Christian Newswire/ -- The College of Biblical Studies-Houston announced today that the College has been awarded reaffirmation of accreditation by SACSCOC. CBS was first awarded SACSCOC accreditation in 2013. SACSCOC is the regional body for the accreditation of degree-granting higher education institutions in the Southern states. Reaffirmation allows CBS to proceed in its pursuit of academic and biblical education excellence. CBS is also nationally accredited by the Association of Biblical Higher Education. CBS is one of only four schools in the nation to have both SACSCOC and ABHE accreditation. Also, in 2016, CBS became a member of the National Council for State Authorization Reciprocity Agreements. This membership authorizes CBS to offer online classes in 49 states, the District of Columbia, the U.S. Virgin Islands and Puerto Rico. "From our students and alumni to our faculty, staff and trustees, today's announcement affirms our collective commitment to academic excellence," said CBS President, Dr. William Blocker.